Majdal Shams | The Highest Druze Village in Israel! This weekend, I was invited to a Druze engagement party in the highest village of the Golan Heights! 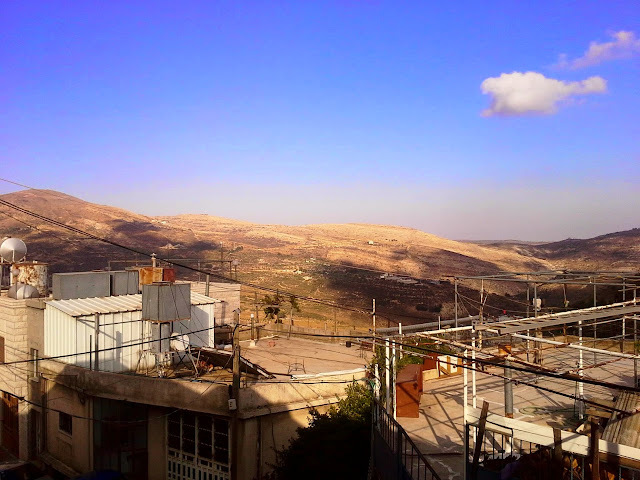 The little Druze town is called Majdal Shams and it is located at the foothills of Mount Hermon, the highest point in Israel. Just wow. From the rooftops you can see the towering mountain behind & in the photo its Syria beyond, just breathtaking. It is also such a unique experience because the Druze people who live in the Golan Heights are originally Syrians as the Golan used to be part of Syria. So they have slightly different customs and also a different Arabic slang to the Druze in the Upper Galilee region where I have been living! Now I can say that I've truly been all around Israel, from the southern-most tip of Eilat at the Red Sea and to the northern-most village right at the bottom of Mount Hermon! How insane. In the last 33 days, I've been centre, south, east, west and to the north. From the mountains to the desert, from the Mediterranean to the Red Sea and the Dead Sea. From the city to the village, from the urban vibe of Tel Aviv and Haifa to the quaint old quarters of Jerusalem and Acre. And if I were to read what I wrote in my 'Why Israel?' article (that I had written a few weeks before my trip) I can truly thank God and say that I've done everything I purposed in my heart to do and see and experience. I wanted to see all of Israel, I wanted to stay in the desert with the Bedouin, I wanted to go to the Golan Heights, I wanted to swim in the Red Sea, and most of all, I wanted to meet and make friends with local Israelis, whether they are Jewish, Arab-Christian, Arab-Muslim, or Druze. I even made an Egyptian friend while at the Red Sea! I still can't believe that so much has happened in the last 5 weeks. This is how I want to travel. I want to learn as I travel, I want to practice the language, I want to make connections and build bridges across seemingly insurmountable barriers. So many of us are experts at reading and analysing the map of where we want to go, but how many of us find courage to actually embark on the reality of the journey itself - filled with challenges and tears, with simple joys and at times melancholic sadness, with difficulties as well as unexpected surprises? Petite Druze women walking down the road in Majdal Shams in the fading light of dusk, after the engagement party I attended! The view from the rooftop of the engagement party home - across the barren plains is the border of Syria and beyond. Quite a surreal feeling at such a sight to behold.